Pinterest is designed for the discovery of content that enables and facilitates people to live the life they always wanted to live. Pinterest has become a social media darling of late, with a host of new features and a $5 billion valuation. For a long time though, the startup was dismissed as a digital scrapbook. More recently, the site has been pegged as a visual search engine, and there have been whispers of Pinterest giving Google a run for its money. The original goal for Google was to organize the world’s information online, which it has done. However, as the company grew, people worked hard to game the system. Over time, the results became less about objectively delivering the most relevant results; now search results are weighted based on a number of factors, including social signals. But Google is still text-based and frankly, not designed for discovery. You have to know exactly what you’re searching for in order to get the best results. Pinterest, on the other hand, has created features to enable its users to discover content they might not have known they were looking for. What Pinterest has created — almost unintentionally — is a database of things in the world that matter to human beings. While Google crunches numbers to figure out what’s relevant, Pinterest’s human users define what is relevant for a given topic. Think about it. If you’re looking for a recipe, you can search Google and get algorithm-selected results from the usual suspects such as The Food Network and All Recipes. 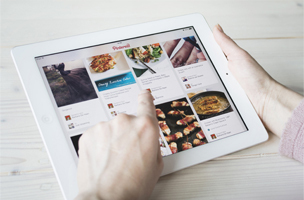 Searching Pinterest will yield results curated and pinned by a human who found the recipe delicious. “Frogs, sneakers, cloud formations, volcanoes, subway graffiti, footie pajamas — Google will deliver Web pages about these things, but Pinterest will show you a photo of the thing itself, and increasingly, the opportunity to buy it or get to it or experience it,” writes Alexis Madrigal. Indeed, where Google is designed for finding and consuming information, Pinterest is designed for enabling people to find content that enhances real-life experiences. It’s designed to facilitate the aspirations people have for their lives, whether it’s travel, their dream wedding or simple DIY projects. It’s not just about consuming, it’s about doing the things you always wanted to do.